The Royal Institute of British Architects (RIBA) is pleased to announce Neave Brown will receive the 2018 Royal Gold Medal, the UK’s highest honour for architecture. Neave Brown, the revered Modernist architect, is perhaps best known for his visionary 1970s Alexandra Road estate near Swiss Cottage built by Camden Council. With its striking stepped concrete terraces and spacious flats, not only does it provide 500 homes but, in Neave’s own words, it’s ”a piece of city”, containing shops, workshops, a community centre, special needs school, children’s centre, a care home for young people with learning difficulties and a 16,000sq m public park. Paulo Mendes da Rocha was born in October 1928 in the city of Vitória- the harbor capital of Espírito Santo, son of the naval engineer Paulo Menezes Mendes da Rocha and Angelina Derenzi, daughter of an Italian family that had emigrated to Brazil. The 2017 Royal Gold Medal medallist was nominated and seconded by architects Neil Gillespie OBE and John McAslan CBE; their comments follow. Paulo Mendes Da Rocha’s nomination was supported by architects Sir David Chipperfield CBE, John Tuomey and Yvonne Farrell. The Royal Institute of British Architects (RIBA) has today announced that the globally-renowned architect Dame Zaha Hadid will receive the 2016 Royal Gold Medal, the first woman to be awarded the prestigious honour in her own right. Given in recognition of a lifetime’s work, the Royal Gold Medal is approved personally by Her Majesty The Queen and is given to a person or group of people who have had a significant influence “either directly or indirectly on the advancement of architecture”. Awarded since 1848, past Royal Gold Medallists include Frank Gehry (2000), Norman Foster (1983), Ludwig Mies van der Rohe (1959), Le Corbusier (1953), Frank Lloyd Wright (1941) and George Gilbert Scott (1859). Zaha Hadid is internationally known for her built, theoretical and academic work. Each of her dynamic and innovative projects builds on over thirty years of revolutionary experimentation and research in the fields of architecture, design and urbanism. Born in Baghdad in 1950, Zaha Hadid started her architectural journey in 1972 studying at the progressive Architectural Association in London. She joined her former professors, Rem Koolhaas and Elia Zenghelis, at the Office for Metropolitan Architecture in Rotterdam, where she became a partner in 1977. 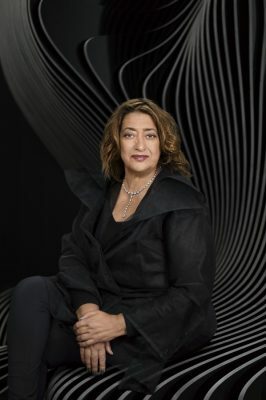 By 1979 she had established her own practice in London – Zaha Hadid Architects – garnering a reputation across the world for her trail-blazing theoretical works including The Peak in Hong Kong (1983), the Kurfürstendamm in Berlin (1986) and the Cardiff Bay Opera House in Wales (1994). Working with office partner Patrik Schumacher, Hadid’s interest is in the interface between architecture, landscape, and geology; which her practice integrates with the use of cutting-edge technologies – the result is often unexpected and dynamic architectural forms. Hadid’s first major built commission, one that catapulted her rise, was the Vitra Fire Station in Weil Am Rhein, Germany (1993); subsequent notable projects including the MAXXI: Italian National Museum of 21st Century Arts in Rome (2009), the London Aquatics Centre for the 2012 Olympic Games (2011) and the Heydar Aliyev Centre in Baku (2013) illustrate her quest for complex, fluid space. Buildings such as the Rosenthal Center for Contemporary Art in Cincinnati (2003) and the Guangzhou Opera House in China (2010) have also been hailed as architecture that transforms our ideas of the future with new spatial concepts and dynamic, visionary forms. In 2004 Zaha Hadid became the first woman to be awarded the Pritzker Architecture Prize. She has twice won the UK’s most prestigious architecture award, the RIBA Stirling Prize: in 2010 for the MAXXI Museum in Rome, a building for the staging of 21st Century art, the distillation of years of experimentation, a mature piece of architecture conveying a calmness that belies the complexities of its form and organisation; and the Evelyn Grace Academy, a unique design, expertly inserted into an extremely tight site, that shows the students, staff and local residents they are valued and celebrates the school’s specialism throughout its fabric, with views of student participation at every turn. Zaha Hadid’s other awards include the Republic of France’s Commandeur de l’Ordre des Arts et des Lettres, Japan’s Praemium Imperiale and in 2012, Zaha Hadid was made a Dame Commander of the Order of the British Empire. She was made Honorary Member of the American Academy of Arts and Letters and Fellow of the American Institute of Architecture. Zaha has held various adademic roles including the Kenzo Tange Chair at the Graduate School of Design, Harvard University; the Sullivan Chair at the University of Illinois, School of Architecture; guest professorships at the Hochschule für Bildende Künste in Hamburg; the Knolton School of Architecture, Ohio and the Masters Studio at Columbia University, New York; the Eero Saarinen Visiting Professor of Architectural Design at Yale University, New Haven, Connecticut and the University of Applied Arts in Vienna. The celebrated architectural critic, historian and writer Joseph Rykwert has this evening (Tuesday 25 February) been presented with the 2014 Royal Gold Medal, one of the world’s most prestigious architecture awards. Given in recognition of a lifetime’s work, the Royal Gold Medal is approved personally by Her Majesty the Queen and is given to a person or group of people who have had a significant influence “either directly or indirectly on the advancement of architecture”. Joseph Rykwert is a world-leading authority on the history of art and architecture; his groundbreaking ideas and work have had a major impact on the thinking of architects and designers since the 1960s and continue to do so to this day. His seminal book The Idea of a Town (1963) remains the pivotal text on understanding why and how cities were and can be formed. He has written numerous influential works of architectural criticism and history, published over a sixty-year period and translated into several languages. The most significant of these are On Adam’s House in Paradise (1972), The First Moderns (1980), The Necessity of Artifice (1982), The Dancing Column: On Order in Architecture (1996), and The Seduction of Place (2002); all have changed the way modern architects and planners think about cities and buildings, and how historians view the architectural roots of the modern era. Rykwert’s works have influenced generations of architects with many either having been taught by him directly or taught in a school where his influence has had a profound effect on a department’s teaching. Distinguished architects David Chipperfield, Frank Gehry and Renzo Piano are amongst the previous Royal Gold Medallists who have personally supported Joseph’s nomination. “If we all had our desserts’, the poet asked, ‘who would scape a whipping?’ Certainly not I. So I can’t think of a Gold Medal as my dessert. It is a wonderful gift which my colleagues have made me and adds weight and authority to my words to which they could never otherwise pretend. Born in Warsaw in 1926, Joseph Rykwert is a naturalized British citizen. He has held a number of university teaching posts in Britain and the United States. He is currently Paul Philippe Cret Professor of Architecture Emeritus and was Professor of Art History at the University of Pennsylvania. Joseph Rykwert has lectured or taught at most of the world’s major schools of architecture and has held visiting appointments at Princeton, the Cooper Union, New York, Harvard Graduate School of Design, the University of Sydney, Louvain, the Institut d’Urbanisme, Paris, the Central European University and others. He has held fellowships at the Center for Advanced Studies in the Visual Arts, Washington and the Getty Center for the History of Art and the Humanities. In 1984, he was appointed Chevalier dans l’ordre des Arts et des Lettres. He holds honorary degrees from the University of Edinburgh, the University of Cordoba, Argentina, the University of Bath, Toronto and Trieste and Rome, and is a member of the Italian Accademia di San Luca and the Polish Academy. In 2000, he was awarded the Bruno Zevi prize in architectural history by the Biennale of Venice and in 2009 the Gold Medal Bellas Artes, Madrid. He has been president of the international council of architectural critics (CICA) since 1996. He joins previous theorists and largely non-practitioners to have been honoured with the Royal Gold Medal including Colin Rowe (1995), Sir John Summerson (1976) and Sir Nikolaus Pevsner (1967). The celebrated architectural critic, historian and writer Joseph Rykwert has been named today (Wednesday 18 September) as the recipient of the 2014 RIBA Royal Gold Medal, one of the world’s most prestigious architecture awards. The world renowned Swiss architect Peter Zumthor last night (Wednesday 6 February 2013) received one of the world’s most prestigious architecture prizes, the Royal Gold Medal at a ceremony at the Royal Institute of British Architects (RIBA) in London. He was presented with the medal by RIBA President Angela Brady, in the presence of over 200 guests. Known for running a small yet powerful and uncompromising practice, Peter Zumthor founded his award-winning firm in 1979 in Switzerland. His most celebrated projects include the Kunsthaus Bregenz in Austria, the Therme Vals (thermal baths) in Vals, Switzerland and the Kolumba Art Museum in Cologne. He designed London’s 2011 Serpentine Pavilion and is currently designing a house in Devon for philosopher Alain de Botton’s Living Architecture architect-designed holiday home scheme. He is exceptionally talented at creating highly atmospheric spaces through his mastery of light and choice of materials. Zumthor’s buildings, such as his small rural chapels and the Thermal Baths at Vals, are an experience for all the senses, with every detail reinforcing the essence of the building and its surroundings. Peter Zumthor will be presented with the Royal Gold Medal on Wednesday 6 February 2013 at a ceremony at the Royal Institute of British Architects in London, during which the 2013 RIBA International and Honorary Fellowships will also be presented. This year’s RIBA Honours Committee was chaired by RIBA President Angela Brady with architects Peter Clegg, Yvonne Farrell, Professor Adrian Forty, Niall McLaughlin and Sarah Wigglesworth.